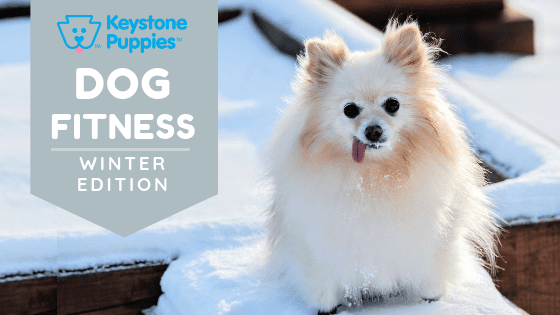 Home Blog Activities Keep Your Dog in Shape This Winter! Winter presents some exercise challenges for many dogs. Smaller dogs may feel overwhelmed by the snow and cold. Dogs with thin coats may be ill-suited to lots of outdoor exercise in the cold weather. And if you live in an area that gets lots of snow or precipitation in the winter, your ability to take your dog outside may be severely limited. That’s why it’s smart to develop a winter routine for your dog that makes the most of temperate days, gives you exercise options when the weather acts up and helps you keep track of your dog’s calories and weight during winter months. Winter weather comes and goes for most parts of the country. Even the coldest parts of the United States usually have short breaks between periods of bad weather. So when the weather allows, get your dog outside. Take long walks. Get to the dog park. Play fetch. Sunshine and fresh air keep dogs happy, centered, and fit. Don’t skimp on outdoor time when the weather permits. Because sooner or later, you’re going to be stuck inside, and taking full advantage of periods of milder weather will keep your dog more balanced over time. P.S. Winter sunshine and exercise are also essential in keeping people happier and more fit. So it’s a win-win. Eventually, it’s going to happen. You’re going to wake up one morning this winter, and the snow will be piled up. Or freezing rain will be pouring down. Or the world will be covered in ice. On those days, it’s hard enough to find ways to get your dog outside to relieve himself, let alone exercise. So what can you do to keep your dog from getting restless or depressed indoors? First of all, check out our blog, “How to Exercise Your Puppy Indoors” to get five great indoor exercise ideas, including calisthenics, indoor training, games, and more. Second of all, remember that a lack of exercise results in restlessness and boredom. Even if you can’t give your pup strenuous physical exercise when winter weather strikes, you can keep him interested and engaged. Experiencing new things or learning new tricks can tire a pup out almost as quickly as physical exercise. Use this time to teach your dogs some new tricks. Set up puzzles for him to solve, such as hiding a treat, guessing which hand holds a favorite toy, or how to use a new toy. Snowy weather may prevent you from driving out to get new toys, but there are many toys you can make for your dog using items around the house. Check out this smart article on how to make dog toys using common household items. If your pup is exercising less, his calorie needs are also going down. And while training and toys may keep your dog busy, they’re probably not burning the same calories as they do with outside play. It’s your job to watch your dog’s weight to keep him healthy and avoid weight-related health issues. Some easy fixes are to substitute dog treats with bits of ice. Many dogs like the cold and the crunch. Bits of baby carrots are also a good substitute for more high-calorie treats. You can also cut up fresh veggies and replace up to 10% of your dog’s kibble with raw carrots, pepper, or even frozen peas. But before you introduce your dog to new foods, check out our blog on which veggies are safe for pups, and which to avoid. Pet scales are a big investment and may not be necessary to control your dog’s weight. Instead, try talking with your vet about your dog’s ideal weight and discuss which signs to look for on your breed that are signs that your pup is getting overweight. Different breeds gain weight differently. It’s important to know how to evaluate a healthy weight on your breed, so you can keep your pet in their best shape. 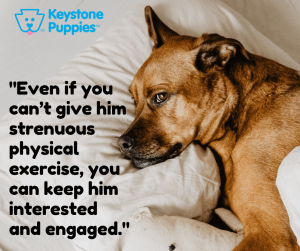 Keystone Puppies cares about your dog. If you’re experiencing severe winter weather, you’ll need to limit time outdoors for many breeds. Check with your vet to understand your breed’s cold tolerance and follow their advice on how to prepare your dog for winter outings. 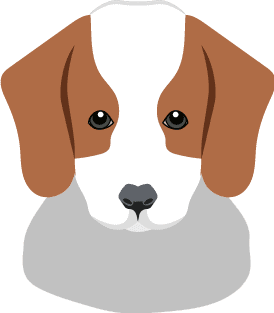 If you want to explore dog breeds and traits, click here to learn about more than 200 dog breeds. If you know what kind of pup you want, click here to get started on finding your new best friend.